“So, let me get this straight, we are going to Williamsburg and we aren’t going to Peter Luger? ?” I asked incredulously as we got in to the car. It was a beautiful autumn day and I was visiting Wendy, Shane, Waverly and their new baby, Grant. 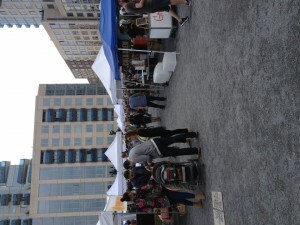 Smorgasburg is a “food flea market” in Brooklyn; it has over 100 food vendors selling everything from the culinary spectrum. It’s overwhelming at first as you wonder around – do I feel like a homemade empanada, a steaming bowl of ramen, a porchetta sandwich or a Venezuelan pupusa? It’s a culinary overload. Finally, we decided to start with dessert first, as the donuts at Dough were irresistible looking. We tried the Dulce le Leche and the blood orange. They are yeast donuts, which means they are light and fluffy, as opposed to the more commonly found cake donuts. Surprisingly, I actually preferred the blood orange; it was tart, tangy and sweet. I thought the Dulce donut was one note, one very sweet note. 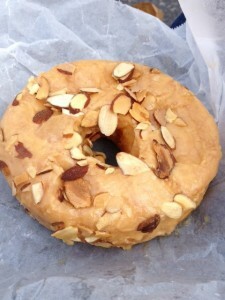 Even at $2.50 a donut, it is worth a visit. Mile End is a Montreal inspired Jewish deli. They have recently released a cookbook and I was dying to try their smoked meat on homemade rye. It was $8 for a tiny sandwich, but it was the best smoked meat I’ve had since Schwartz’s in Montreal. 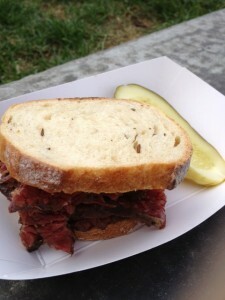 I wish I could find a deli in Boston that has smoked meat. 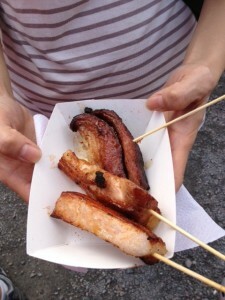 The grilled maple bacon stick was outrageously good – smoky, sweet, salty, and unctuous all at the same time. I would eat this again and again. Kudos to Wendy, as this was her selection. The first thing you notice at Mighty Quinn’s is the long line and you ask yourself, what do these people know that I don’t? Quickly, the line moves quickly, as there are only two options: pulled lamb and smoked brisket sandwiches in 2 sizes ($5 and $8). 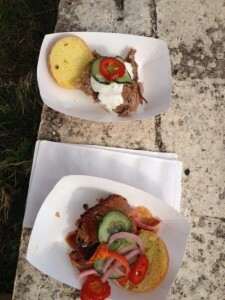 We get a small slider of each meat and discovered the glory of lamb BBQ, which I’ve never had before. It was tender, smoky and delicious. I’m going to have to convince someone with a smoker and a BBQ to try making it next summer. 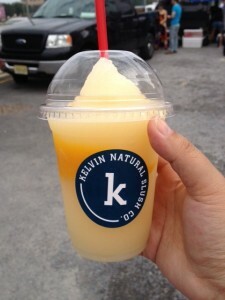 After all the rich food, I opted for a refreshing citrus slush ($5) with a mango mix-in from Kelvin’s natural slush. This is a not 7-11 slushie; there was barely a hint of sweetness making it a tart, refreshing and sophisticated version of a favorite childhood treat. Shane picked up a Trufa Seca (dry cured black truffle sausage) from Charlito’s Cocina which we devoured later with cheese and crackers. I thought it was excellent with the prominent truffle flavor. This would make a great addition to any charcuterie board. 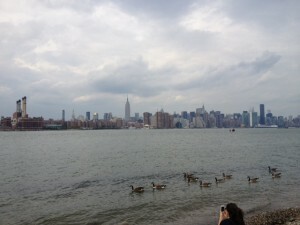 After we gathered our goods, we found a place in the grass and enjoyed our bounty of deliciousness with a view of the Manhattan skyline. I guess there are now 2 reasons to go to Williamsburg.